How long have you been coming to DVS? R:I started when I was 8 and came until I was about 11. I took a break for two and a half years, and this is my fourth year back. What do you like doing at DVS? R: I do all sorts of things. I hang out with friends. We play card games. I like listening to them all sing at the top of their lungs. I hang out with some of my male friends who like to play video games or role playing games. I have taken classes. Currently I’m not taking any, but I think I’m going to start up a math class. At one point I was taking 14 classes at once, because they’re not all every day. I’ve taken language courses like French and Italian. I’ve taken English. I’ve taken photography, English literature, zine making, math, SAT prep, cooking, vegan cooking, candy making, arts and crafts. I think that might be all. Over time, have there been changes in the things you like doing? R: Absolutely. There are trends. Like for a while last spring we were watching a lot of movies in the tech room. People would rent movies and bring them. Card games were really big. There was this whole hearts tournament, and we had this binder where we kept the scores. I went through a phase of just piling on all these classes, and I was also taking classes outside the school. That sort of petered out, as I became more comfortable feeling like I was getting a lot of valuable things out of just hanging out. How do you decide what to do each day? R: You come in, and you see what other people are doing. Sometimes I have things I want to get done, like I want to read more of my book, or right now I’m making a baby blanket for my nephew who’s going to be born. Then sometimes I have ideas in my head for things I want to do, but most of the time I get here and wing it. How do you get the resources you need to do the things you choose to do here? R: Well, I think that a lot of what people learn here is how to get resources. A couple of years ago I re-discovered the public library, and I got way more library savvy. I can go on line and put a hold on books. I can walk several blocks from DVS and just go to the library. I’ll get maybe 15 books at once, and of course I can’t finish all of them, so I’ll renew some of them. 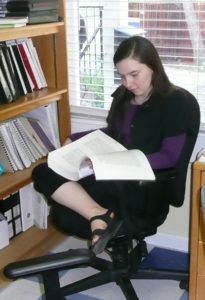 The library here at DVS is more limited, but there’s no time limit; you just return the book when you’re done with it. So sometimes I’ll have the school library book at the bottom of my pile for months and I’ll feel bad about it, and I’ll bring it back. DVC [Diablo Valley College] is another great resource. What are you most proud of that you’ve done during your time at DVS? R: There are different areas of my life that I judge in different ways. Probably the academic thing I’m most proud of would be the Latin Workshop, a 10-unit intensive workshop I did in the summer at UC Berkeley. I had to petition to get in, because it was designed for grad students. I got a B-plus. I think there are other things that are really important. When I first came to DVS, I had a lot of social issues. I didn’t have a lot of self-confidence, and I would get angry easily. In my old [public] school, when people didn’t want to play with me, I would just feel like, “Well, I’m a better student than all of them. I’m better than them.” But here, if friends are mad at me, I can’t say I’m better than them, because there are no grades. So, I had to actually learn when I was doing things that were wrong, or maybe it was other people doing things wrong, but maybe that’s not so important. Right or wrong, sometimes you have to let things go. I had to learn how to resolve things, no matter who was wrong. I’m really proud of the fact that I’ve really come out of my shell. Back when I had all those confidence issues, my Mom would suggest that I might want to take college classes, but the idea would freak me out. I’d be worried that there’d be a lot of people older than me there, and they’d know more. I couldn’t stand the idea of not being able to do well, and trying and failing. Then the Latin Workshop seemed like this huge thing, but I was willing to go and do it. I failed the first test and I kept going, and the test after that I got a B. I wanted to learn the language, that’s what I was there for. I wasn’t there for the pat on the back. Is there anything you are working on improving? R: I’m always working on improving everything. Right now, I’m working on becoming more open-minded. I consider myself a very open minded person. I accept lots of different views, but now that my little sister is becoming a teenager, I realize that I do have some views and this is the way I do things. I sometimes get uncomfortable that she likes to do things differently. So I guess I’m working on that. In terms of skills, I’m working on essay writing, writing about myself. I took Freshman Composition at DVC, and I got an A. That was a good experience and I learned a lot about essay writing. But I’ve never had as much trouble writing about other things as I have at writing about myself. For college entrance essays, I’ll need to write about myself. Has the staff helped you in any way? R:Absolutely. The staff here are wonderful. Just as friends, as support, as teachers. The staff are great. I have so many adults to go to. I have a much better relationship with my parents because of this school; there’s not that constant pressure of them forcing me to do something I don’t want to do. My parents are so open and accepting of all the different things I like to do. And I also feel like I can go to the staff. I have friends in public school, and they’ll have really big problems, and they feel they have no adults to go to. They feel like their parents will punish them for something they’ve done wrong, and they have no comfort whatsoever going to teachers. It really scares me when I have friends and they have zero adults to go to, and I’m the closest thing to an adult they go to. Adults and children should be a lot more equal in society, but adults have had more experience. So in your teenage years when you’re going through a lot of problems for the first time, they’ve already been through it. Definitely, the staff has been very helpful and awesome. What do you think about how decisions are made at DVS? R:I think it’s a very good system. Lately I’ve been exposed to consensus [a different system from what we use here.] The idea of consensus is that no one is left out. In democracy, it can be like no one is hearing the minority out. So consensus forces people to really listen to each other and make compromises so everyone is happy. But I feel like that sort of is a cop-out. With democracy, you can respectfully have your own opinion and you don’t have to be forced to compromise. You can be out-voted, and still have your own opinion. When you have a group of people that are trying to make everyone happy, no system can do that for you, it has to be the people. There are times in JC [Judicial Committee] where even though everyone would vote for a particular sentence, the person who is guilty – and sometimes it’s a little kid – says, I don’t want to do that sentence, and this is something different that would help me remember better next time not to break that rule. And everyone, even though they were going to vote for the first sentence, ends up voting for the different one instead. Or in School Meeting, the majority might want to vote to pass a motion, but the person who made the motion might amend it for someone who was going to vote against it, just to make them happy. The goal is to make as many people as possible happy, even if you can outvote them. Consensus is sort of like trying to force that, but I feel you can’t force it. I feel democracy is more honest. No system is going to work if no one wants to agree with each other. It’s the group of people that really make the difference, and that’s what we have here. I feel democracy is the best way to run things. How do people get along together here? R: Really well. Obviously, there are confrontations. That happens everywhere. But there aren’t cliques, which is really nice. I personally am a floater; I really hang out with a lot of different groups. There are no defined groups, but there are people that are closer friends that hang out together a lot more. A lot of my friends graduated last year, so this year I hang out with Micaela and Griffin, or my sister and her friends, and sometimes the teenage boys, and sometimes the little kids, reading them stories or running around playing games with them. There’s no judgment if someone wants to hang out with a different group. There are conflicts, and individual people get into arguments, but you’ll see friendships between people who have years difference between them, like best friends who are four or five years apart, which is really cool. And you’ll also have groups that are really fluid, and flow into and out of each other. You don’t get a lot of exclusion. People tend to pair off based on what they’re doing, as opposed to who they are. Have you ever had a conflict or frustration that you resolved here? How did it get resolved? R: Of course, all the time. Can I pick just one? People leave the sliding glass door open when we have the heat going, it’s a huge waste of electricity, and it drives me nuts! The most recent complaint I wrote was for three people who were exiting the sliding glass door, and I reminded them, but they walked through and didn’t close the door. I know that sounds like a little thing. Since I’ve been getting on people’s case about this, in general, more people close the door now. It’s a work in progress. I don’t have as much conflict as when I was younger. In general I’m kind of a low drama person. What would you advise another kid who is thinking about coming to DVS? R: Come! It’s an incredibly hard school to go to. Don’t think its going to be easy. But every kid I have seen, who wanted to be here, has been better for coming. The only time it doesn’t work is when people don’t want to be here. If you’re a kid who wants to be here, you end up working on the things you need to work on, regardless of whether you try to. When I first came here, I did almost no academics, and I had always been fine in academics. Academics were never a problem for me. I came here, and I ended up working on all of these social issues. I was always butting heads with people, because what you need help with just comes out in this space. What are you thinking of doing after you leave DVS? R:I’m going to work during my last year at DVS, and come here part time. Because I left for a short space of time, I feel I would be better for staying here longer. Then I’m going to go to college. I’m still deciding what college. I’m looking into classics. I love languages like Latin, ancient mythology, and philosophy. So I’m looking for alternatives where I could design my own unique major. I’m researching colleges now.